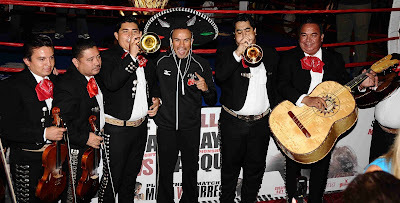 Three-Time World Champion Juan Manuel Marquez sings with a Mariachi band during his grand arrival at MGM Grand in Las Vegas, Nevada on September 9, 2008. Marquez will face Ring Magazine World Lightweight Champion Joel Casamayor on September 13, 2008 at MGM Grand Garden Arena in a bout which will be distributed by HBO Pay-Per-View. 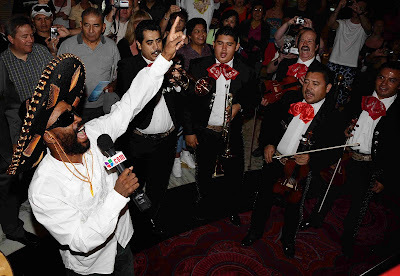 Ring Magazine World Lightweight Champion Joel Casamayor sings with a Mariachi band during his grand arrival at MGM Grand in Las Vegas, Nevada on September 9, 2008. Casamayor will defend his Ring Magazine World Lightweight Title against Three-Time World Champion Juan Manuel Marquez on September 13, 2008 at MGM Grand Garden Arena in a bout which will be distributed by HBO Pay-Per-View. 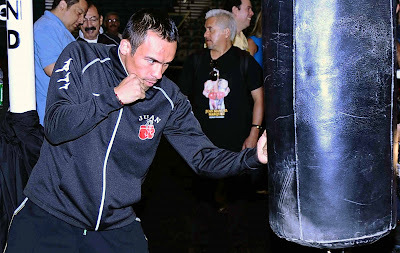 Three-Time World Champion Juan Manuel Marquez works out for the media at MGM Grand in Las Vegas, Nevada on September 9, 2008 in preparation for his September 13, 2008 title challenge against Ring Magazine World Lightweight Champion Joel Casamayor at MGM Grand Garden Arena in a bout which will be distributed by HBO Pay-Per-View. Ring Magazine World Lightweight Champion Joel Casamayor works out for the media at MGM Grand in Las Vegas, Nevada on September 9, 2008 in preparation for his September 13, 2008 title defense against Three-Time World Champion Juan Manuel Marquez at MGM Grand Garden Arena in a bout which will be distributed by HBO Pay-Per-View.